It always interests me that the young monitors are so vividly coloured compared to the adults. We see it with the two types that occur here in South Africa as well. It seems to go against the conventional wisdom that the small ones should be cryptically coloured to hide away while the adults should be colourful to attract a mate? Its is a very interesting question indeed Dries. 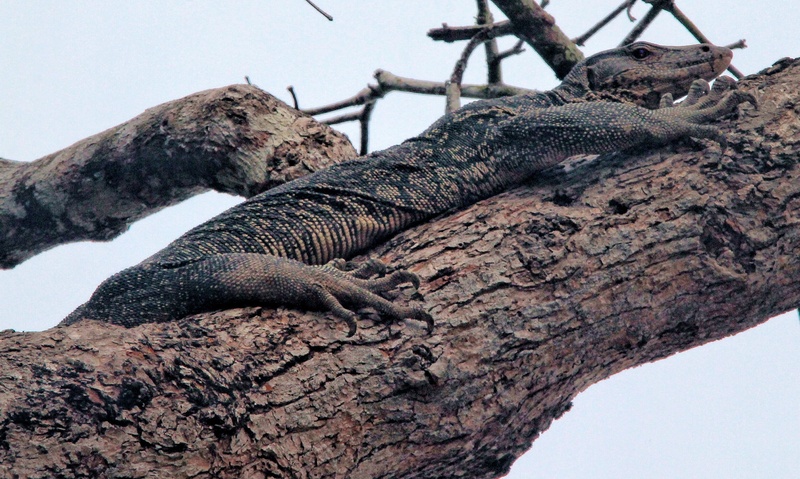 The fading colouring of adult lizards is a poorly understood phenomenon. One theory is that young lizards forage more actively and are therefore more prone to predation – they would need to be better camouflaged than adult lizards. Other studies have linked fading colours with physiological, psychosocial or environmental stress, although most the precise mechanisms remain largely unknown. I guess we need to ask a dragon expert to shed a bit more light on this don’t we? Water Monitor is a interesting name for the lizard, is it because it likes spending time in water? I really like your close up shot, very nice! They do live around rivers and are good swimmers indeed. But they are very agile climbers and fast runners too – they don’t rely on ambush but just outrun their prey.